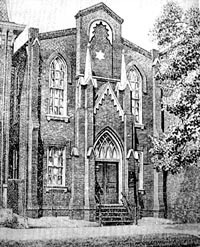 Beth El Hebrew's first synagogue. Until the mid-twentieth century, most of Northern Virginia—loosely defined as the areas encompassing Fairfax, Loudoun, Arlington, and Prince William Counties, as well as the independent cities of Alexandria and Falls Church—consisted of small, rural agricultural communities. Aside from Alexandria, which had become a thriving port city in the mid-1800s and home to two Jewish congregations, there was no organized Jewish life in the region until the early 1940s. The growth of the Jewish population—and the D.C. region as a whole—coincided with President Franklin Roosevelt’s arrival in Washington in 1933. Specifically, Roosevelt’s efforts to expand federal agencies brought thousands of new federal employees to area, some of whom settled “across the Potomac” in Northern Virginia, where property was often cheaper. Though the region started out as a bedroom community for federal workers commuting to Washington, it quickly developed as a permanent extension of the city—with the Pentagon completed in 1943 and the Washington Dulles International Airport finished in 1962. Prior to this mid-century growth, there were very few Jews scattered across the Northern Virginia region, aside from Alexandria. Most worked as merchants traveling among small farming communities selling clothing and dry goods. Russian immigrants Harry and Esther Levy, for instance, arrived in Leesburg in the mid-1880s, where Harry worked as a peddler in the Bull Run Mountains. By 1913, the couple had moved to Alexandria, joining dozens of other Jewish families in the city. This pattern was quite common; because there were never enough Jews to form a community of their own in the outer regions of Northern Virginia, they often traveled to Alexandria or Washington for Jewish holiday services—and many decided to stay there. In the 1930s, however, amidst the wave of federal expansion, this all began to change. Jews were among the large wave of federal employees that flocked to the D.C. area for work, and they were soon a growing presence in the Northern Virginia region. Over the next two decades, they began to form their own communities, and it no longer became necessary to commute to D.C. or Alexandria for Jewish life. By the summer of 1940, five men in Arlington—recognizing the growth of the county’s Jewish population—decided to organize their own congregation. The group elected Herman Schwarzman as president. That year, the new community held their first high holiday services in the Aston Heights Women’s Club building. Sixty-six Arlington Jewish residents attended. Such a large turnout confirmed the growing community’s desire for a permanent Jewish congregation in Arlington. They began to hold regular Friday night services at the home of Abe and Esther Beyda, and in 1942, the congregation hired Rabbi Arthur Hertzberg, a graduate of the Jewish Theological Seminary, as a part-time rabbi. By 1943, the congregation—officially named the “Arlington Jewish Community Center”—had grown to 65 families, and they hired recent JTS graduate Rabbi Samuel Berkowitz as their first full-time rabbi. That same year, in 1943, Arlington County witnessed a drastic population increase when the Pentagon building, the new headquarters of the U.S. Defense Department, was completed. Over the next decade, the total population of Arlington County grew from about 57,000 in 1940 to over 135,000 in 1950. The Jewish population in the county continued to grow as well, reaching about 700 families in 1946. Alexandria, in comparison, had only about 200 families at the time. In light of this growth, the Arlington congregation decided it was ready to invest in a synagogue building of its own. After five years of fundraising efforts, on February 22, 1948, the congregation moved into its new building on the corner of Lee Boulevard and Fenwick Street. The new building quickly became the heart of Arlington County’s growing Jewish community. Specifically, many of the new Jewish social and civic organizations that sprung up throughout the 1950s gathered there, including B’nai B’rith, Jewish War Veterans Post #589, Hadassah, B’nai B’rith Women, and Bridge Club. At high holiday services in 1955, there were over 500 people in attendance. The congregation’s Sunday school, moreover, had also grown to about 250 students. Despite the Arlington congregation’s growth, much of Northern Virginia beyond Alexandria and Arlington County remained largely undeveloped throughout the 1950s, and correspondingly the region’s Jewish population remained relatively small. Many more Jews arriving in the area chose to settle in the Maryland suburbs and D.C. proper—finding a larger Jewish presence there—rather than Northern Virginia, which some still saw as a Jewish “backwater” in comparison. Indeed, by 1956, out of about 80,900 Jewish residents in the D.C. metropolitan region, only about 6,400 lived across Northern Virginia, mostly concentrated in Arlington and Alexandria. By the late 1950s, there were still only three synagogues in the region: the Arlington-Fairfax Jewish Community Center and the two congregations in Alexandria, Temple Beth-El and Agudas Achim. Therefore, the Jews scattered across Loudoun and Fairfax Counties were left with three options: give up organized Jewish life altogether, make the long trip to synagogue each week, or begin to establish their own congregations. Though the third option was daunting to many, some Jewish families decided that the weekly “schlep” to Arlington and Alexandria was too much for themselves and their young children and were ready to build their own congregations. By the early 1960s, this idea became a reality as two major federal transportation projects brought large growth to Fairfax and Loudoun Counties. The completion of Washington Dulles International Airport in 1962 and the Capital Beltway in 1964 made travel to and from Washington much easier, so many families—including many Jewish families—decided to “move West” into these counties, where the land was much more affordable. In light of this growth, six Jewish families in Fairfax banded together to found Congregation Olam Tikvah in 1964. In the early years, the congregation held lay-led services in members’ homes, religious school in area public schools, and high holiday services in local churches. In 1966, after only two years in existence, the congregation’s membership reached almost 100 families. It was time, they decided, for both a full-time rabbi and permanent house of worship. In 1966, the congregation purchased a small building on Glenbrook Road, and the following year in 1967, Rabbi Itzhaq M. Klirs arrived as the first full-time spiritual leader. He served the congregation until 1994, witnessing major expansion. Today, Congregation Olam Tikvah—formally affiliated with the Conservative movement—serves over 620 families, with 175 students in its religious school. In December 1966, another small group of Jewish families from Herndon, Leesburg, and Reston had the same idea. Like Congregation Olam Tikvah, the group first worshipped together as a couple of families at Lake Anne, but soon recognized the high demand for an organized Jewish community in Reston. The following year, they formally became the Northern Virginia Hebrew Congregation. The group affiliated with the Reform movement and met regularly in various locations in the Reston area. By 1972, as the congregation’s membership reached over 80 families, they decided to hire their first full-time rabbi, Arnold Siegel, a graduate of Hebrew Union College. Membership doubled by 1981, with 160 households; that same year, the congregation moved into its first building on Wiehle Avenue in Reston. Today, the NVHC has grown to almost 500 families and continues to thrive under the leadership of Rabbi Michael Garret Holzman. While many of these Northern Virginia congregations were created out of whole cloth, the first Jewish congregation in Falls Church was a breakaway from Temple Beth El in Alexandria. In 1962, about thirty members of Beth El decided to form their own congregation after disputes over Beth El’s rabbinic and lay leadership. In June of that year, the group met at Donald and Sybil Lubin’s home in McLean to discuss forming a new Reform congregation in Falls Church. After receiving support from the Union of American Hebrew Congregations, the group formally established Temple Rodef Shalom, electing C. Ira Funston as their first president. The following month, Larry Seiff led the 34 families in the congregation’s first Shabbat services in the basement of the Fink Professional Building in Falls Church. Within a year, Rodef Shalom’s membership had risen to 100 families, and the congregation hired Rabbi Laszlo Berkowits, an HUC graduate, as their first full-time rabbi. He stayed for 34 years. In October 1970, after years of fundraising efforts for a building of its own, Temple Rodef Shalom moved to its first official house of worship on Westmoreland Street in Falls Church. At the time, membership had reached 275 families. Rabbis from Richmond and Washington took part in the dedication ceremonies. Just one year after the new temple was complete, however, the congregation’s joy quickly turned to horror as they experienced two disturbing acts of violence against the temple. In the early morning of October 25, 1971, 19 rifle shots shattered the front windows of the building—which, thankfully, was unoccupied at the time. Just one month later, on the morning of Thanksgiving, more shotgun blasts smashed the remaining front window and lights. Again, nobody was injured. The Fairfax Police had no leads on who committed the violence, though they provided patrol car coverage for the following months. The temple also received an outpouring of support from local churches and civic groups; the Catholic University Players even staged a musical performance to help raise money to replace the damaged windows. Over the next two decades, Temple Rodef Shalom continued to grow, reaching 628 families in 1985. Unfortunately, three years later, the congregation witnessed another isolated act of vandalism. In October 1988, vandals smeared obscenities, Ku Klux Klan references, and anti-Semitic slogans on the gateposts and front of the temple building. Like in the past, the congregation experienced an outpouring of community support, receiving over 100 letters expressing outrage and donations for repair from neighbors and area churches. Moreover, Rabbi Berkowits—himself a Holocaust survivor—was invited to speak about prejudice at the local McLean High School, where anti-Semitic graffiti had appeared in the girls’ bathroom the previous year. Later in October, two teenagers were charged for the temple vandalism. The congregation has not witnessed any acts of violence since. Beth Emeth in HerndonThroughout the 1970s and 80s, a number of new congregations sprung up across Northern Virginia as the Jewish population continued to grow and move out to Fairfax and Loudoun Counties. For the most part, these congregations began as only a few families gathering for worship, but quickly expanded into larger congregations as the demand for a Jewish community grew. Congregation Beth Emeth, for instance, was founded by fifteen families in Herndon in June 1979. By that September, they already had forty families, and within a decade, the Conservative congregation had moved into its own building and hired Rabbi David Ebstein as their first full-time rabbi. Today, Beth Emeth has about 480 families, led by Rabbi Michelle Goldsmith. In 1981, about 20 miles south of Congregation Beth Emeth in Herndon, another small group of families in Springfield founded Congregation Adat Reyim. By the early 1990s, the congregation had grown to over 230 families and moved into their own synagogue building. Today, Adat Reyim—which identifies as unaffiliated progressive Conservative—has over 300 families, led by Rabbi Bruce Aft. In 1986, another group of Jewish residents of West Springfield and Burke discussed the potential for creating a Reform congregation. In 1986, after a few families received an overwhelmingly positive response to the ads they placed in local newspapers and stores, they established Temple B’nai Shalom with about 125 families. Amy Perlin, the former assistant rabbi at Temple Beth-El in Alexandria, became the new congregation’s first full-time rabbi. Today, Rabbi Perlin continues to serve the congregation, which has grown to almost 500 families with 240 children in its religious school. While most congregations that began in the 1970s and 80s have rapidly grown in membership, some have remained deliberately small and lay-led. Reston’s Shoreshim, for instance, began as a non-denominational community chavurah in 1977 and today continues as a lay-led group of about 85 members. By 1986, Northern Virginia was home to fourteen Jewish congregations—as compared to four in 1976—as well as the Gesher Jewish Day School in Fairfax, founded in 1982. Still, despite such rapid growth, many Jews felt little sense of connection to the larger Northern Virginia Jewish community. In an attempt to combat this, a group of Northern Virginians met with representatives of the Jewish Community Center (JCC) of Greater Washington and began to plan a centralized JCC for the region. On May 9, 1980, the JCC-Northern Virginia officially began operation, and ten years later, the organization moved into the Henry S. Reich building in Fairfax, holding a community-wide dedication ceremony attended by Governor Douglas Wilder. By the early 1990s, Northern Virginia experienced another wave of growth—as did the region’s Jewish communities. While most residents remained professionally tied to the federal government, a number of technology-intensive federal contractors were established in the area, making Northern Virginia an employment center of its own. Consequently, Northern Virginia’s population doubled between 1980 and 2010, accounting for over half of the Washington metro area’s total growth. Interior of Temple Beth Torah, CentrevilleOnce again, this growth sparked a number of new congregations to form in the 1990s. In 1994, two Jewish families in Centreville placed an ad in the local newspaper seeking other Jewish families with whom to celebrate holidays; within a week, they received over forty responses. In January 1995, 45 members established the Centreville Area Jewish Community Center, later renamed Temple Beth Torah. Rabbi Kenneth Barry Block has served the Reform congregation since 1998, which moved into its first building in 2010. In neighboring Loudoun County, another group of families, led by Sidney Lissner, began to meet for services in June 1996. The group started as the unaffiliated Loudoun Jewish Congregation, but soon two factions emerged within the congregation: one sought a Reform worship style, while the other preferred Conservative. In 1997, they decided to separate, and the Reform group founded Beth Chaverim, while the Conservative group remained Loudoun Jewish Congregation. In 2007, Beth Chaverim moved to its permanent home in Ashburn, and hired its first full-time rabbi, Linda Joseph, in 2010. Today, Beth Chaverim has approximately 130 member families and 160 children in its religious school. Sha'are Shalom, LeesburgIn 1998, the Conservative Loudoun Jewish Congregation received an unexpected donation when long-time Jewish Loudoun resident Irwin Uran gave the congregation $2 million to build the county’s first ever synagogue. At the time, not one of the 45 families of the congregation knew Uran personally—he was known as a reclusive philanthropist who made a fortune in investments—but they were quite grateful for his generous gift, and began to make building plans. Uran’s motive for the gift was to ensure a lasting Jewish presence in Loudoun and to combat any lingering anti-Semitism in the region. In September 2004, the congregation—renamed Sha’are Shalom—officially moved into their new home on Evergreen Mills Road in Leesburg. Today, Rabbi Michael Ragozin serves the growing congregation. In 1999, over in Fauquier County, David Pfeffer, a urologist in Warrenton, also placed an ad in the local newspaper seeking interest in a Jewish community—and once again, he soon received about thirty positive responses. A few weeks later, Pfeffer held a potluck dinner at his house for the area’s Jews, many of whom also sought to expose their children to Judaism and other Jewish children. The group, which called itself the Fauquier Jewish Congregation, began to hold monthly services in St. James Episcopal Church, usually with about fifty families in attendance. In 2013, Rose Jacob served as rabbi of the congregation, which continues to meet at St. James Church. By 2000, Jews had established a major presence across Northern Virginia. However, there were still very few Orthodox Jews who settled in the region, since it lacked typical institutions of a traditional community—like kosher butchers or restaurants. In 2002, Adam August and Moshe Landman sought to change this when they founded Fairfax Kehilah, and began to hold Friday evening services in August’s living room, complete with a portable mechitza and Orthodox prayer books. About 10 to 12 families attended services regularly. The community continues to remain small yet active today. The only other Orthodox Jewish presence in Northern Virginia today is three Chabad-Lubavitch Houses, located in Alexandria, Fairfax, and Tyson’s Corner. Still, there remain few kosher dining options and little Orthodox infrastructure, which have led more observant Jews to settle in Maryland and Washington. Today, there are 26 active congregations across Northern Virginia, including the state’s largest Conservative and Reform congregations: the Conservative Olam Tikvah in Fairfax has 620 families, while the Reform Temple Rodef Shalom in Falls Church has about 1600 households. In 2003, there were about 68,000 Jews across Northern Virginia; today, that figure is certainly higher. Far from being the Jewish “backwater” it was said to be fifty years ago, Northern Virginia today is home to a thriving Jewish community, which will surely continue to flourish in the future.